Good Kali In The Park session today. Not that there’s ever going to be a bad one. Good work Gav, Tony, Red, M.A. We covered some progressive material, of which there are lifetimes worth of things that can be touched upon, and we stepped back to explore what the real bottom line of what we’re training to do is. 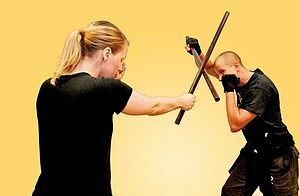 It’s not just about self defense and “Do this, this way,” or about defending the integrity of the style, but about contributing to the individuals personal growth, through some aspects of a particular training. 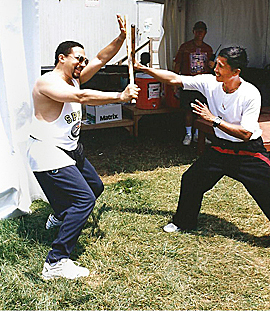 In a way, it’s easy to teach a martial art. Get a belt or make one up, use a memorized chart of steps and forms, repeat. But to use martial arts training to bring joy, grace, to expand consciousness, to create well being, to really develop holistic self confidence is another story. That’s the story I want to take part in with my students and friends. I’ll remind you all again, make notes, practice at home, once given to you by me it’s yours, develop it, make it your own.Sticks are in, I have 3 sets left. We’ll be presenting and training in other venues soon, make sure I have your emails for notices, or check back to the blog often. See you all next week (or sooner)! Had a good time getting together for our Kali in the park after the holidays. Welcome to our latest guest, Marianne, we look forward to seeing you again. To those who missed it, we missed you as well, stay in touch. To everyone, keep a small notebook! So you can review material on your own, and since we are all at different levels of learning and instruction, you can keep me up on what you’ve been instructed and practiced in. Keep me informed! Sound weird? Here’s why. I really don’t teach a “System” or particular style. (I do but I don’t, you’ll see) I teach and train skill sets to individuals. There are many skill sets I draw from and I try to adapt the details of the skill set to a person’s personality and character, body type, agility, goals, and capacity. And thats cool, so long as WE get it to work for YOU, spontaneously, even with so called imperfections, when You really need it. See you all next Sunday and subscribe! If we change time or place, have a special seminar, get in supplies, this will be where it gets mentioned..